GCE NODE organized a workshop on AI+Safety on October 15 at Tordenskjolsgate 9, Kristiansand. 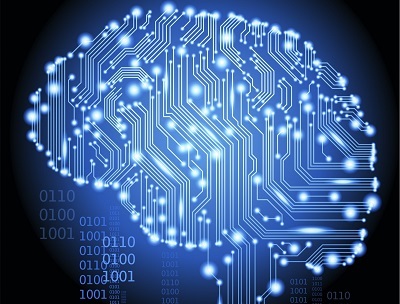 10-12: Basics of Graph Signal Processing, possible applications in different domains (within the SFI OM project) and Feedback from industrial partners. 13-14: Brief review of already well-functioning cooperation cases with industrial partners in WP6. 14-15: Exploration of new cooperation opportunities with industrial partners, associated use cases and strategies. With a lot of mathematics and programming the PhD candidate Sondre Sanden Tørdal has developed a technology which compensates for movements and enables cranes on ships to make stable lifts in rough sea. PhD candidate Sondre Sanden Tørdal at UiA was offered employment contract at the R&D department at MacGregor Norway before he handed in his PhD thesis in mechatronics. Sondre Sanden Tørdal at the University of Agder has developed robot technology and is employed by MacGregor Norway before he handed in the final version of his PhD thesis in mechatronics. The thesis will be handed in during October 2018. Afterwards Tørdal will join the R&D team at MacGregor Norway to continue development of the technology. Load handling on ships are risky operations. This technology has the potential to reduce risks, increase safety and efficiency. It will be exciting to develop this technology further at MacGregor towards a product, says Tørdal. 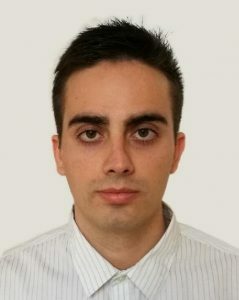 Tørdal completed both his bachelor and his master education in mechatronics at UiA and started as a PhD candidate in 2015 in the research centre SFI Offshore Mechatronics. This project is the largest ever coordinated by UiA. The project period is from 2015-2023 and the goal is to increase collaboration and innovation with research active companies in industry and other excellent research groups in Norway and abroad. Currently the centre has 22 PhD candidates, 2 Post.Docs and 42 Bachelor and Master thesis projects in various fields at UiA, Aalborg University, NTNU and RWTH Aachen. Tørdal is the first SFI PhD candidate to complete his project at UiA. The centre leader for the SFI and Tørdal’s supervisor, Geir Hovland, congratulates Sondre with his new position at MacGregor. “Sondre has shown a great enthusiasm throughout his PhD period and put in a large effort. In total he has spent 8 years on UiA Campus Grimstad”, says Hovland. MacGregor is a supplier of engineering solutions and services within maritime and offshore load handling. 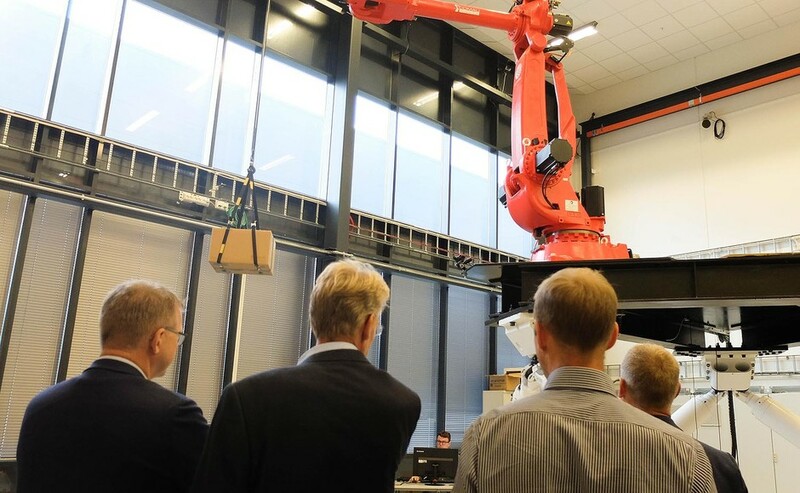 On September 7 the management team at MacGregor Norway visited UiA’s mechatronics lab in Grimstad. There they got a demonstration of the technology developed by Tørdal. In the lab they got to see two Stewart platforms which moved similar to offshore vessels in waves. Høye G. Høyesen is the CEO of MacGregor Norway and he is convinced that this technology is something the industry can make use of. 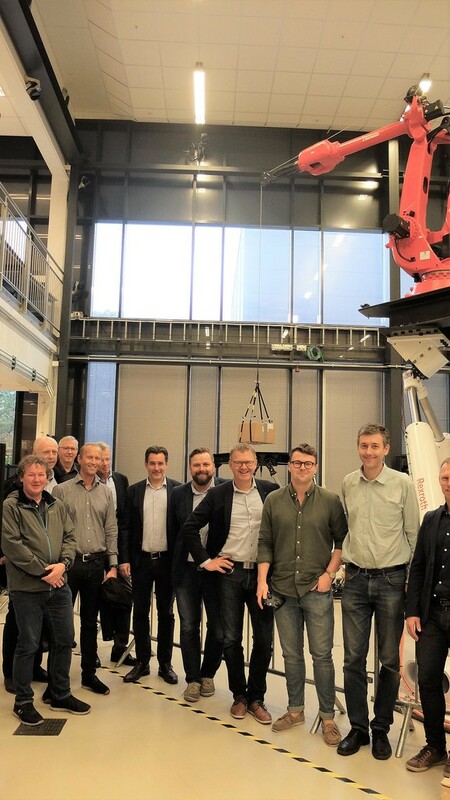 The management team in MacGregor Norway visited the motion-lab in Grimstad and got a demonstration by PhD candidate Sondre Sanden Tørdal’s robot technology. From left: Jan Martin Grindheim, Eivind Gimming Stensland, Geir Grasmo (UiA), Ingvar Apeland, Bjørn Fossestøl, Rune Klausen, Tor Eide, Høye G. Høyesen, Sondre Sanden Tørdal, Geir Hovland (UiA) and Geir Roland. – The research done in the SFI Offshore Mechatronics is a valuable resource for the industry. The robot technology which Tørdal has developed will contribute to safer transportation and load handling at sea. We live in an interesting time when industrial machines become increasingly more automated and autonomous. I am convinced that this technology will become further developed into a product which MacGregor can sell, says Høyesen. MacGregor has been involved in Tørdal’s project since the beginning in 2015. Høyesen says that the collaboration with the SFI centre is very exciting and one result is the fact that MacGregor “hijacks” Tørdal to work for them and to realize the technology into a product. The leader for the R&D department in the offshore division at MacGregor and Tørdal’s new colleague is Eivind Gimming Stensland. He is currently in the management board in the SFI Offshore Mechatronics centre and has watched Tørdal during the entire project period. He is impressed by what Tørdal has developed and is very satisfied that he now joins MacGregor to develop the product further. Gimming Stensland tells that the technology is very relevant as part of MacGregor’s digitization process. – From a financial perspective this product will contribute to more efficient load handling operations. Ships can deliver more cargo in the same amount of time as before and this will result in added value for our customers. The technology will make us less dependent on weather windows and give more time for heavy lifts. As a result of this less fuel is consumed and the environmental impact is reduced, says Gimming Stensland. – The SFI centre is very satisifed with the collaboration with MacGregor, says Hovland, and says also that the visit from the management team gives the centre a motivation boost to continue its work. The University of Agder was the first educational institution in Norway to offer a degree in mechatronics at both bachelor and master levels. The education program gave Tørdal continuously confirmations that this was an exciting field to work in, and that was the reason for him to continue from bachelor to master, and from master to PhD. – At bachelor and master levels I felt that the learning process went well, and it was both interesting and challenging. It has been very exciting to build and further develop Motion Lab to what it has become today. That process has, at times, been both frustrating and challenging, while it gave me a drive to continue the development of the technology. In the PhD thesis the complexity of my work kept increasing, and that was particularly motivating. The project has been a test of patience for Tørdal. As an advice to other students who struggle to decide what to become or to research on, he says: Choose something which makes you happy and don’t listen to others! Below is a video demonstrating Tørdal’s solution, showing damping of a swinging payload in presence of wave-induced motions simulated by the two Stewart platforms. The industrial robot with a winch mounted simulates a scaled-down offshore crane.